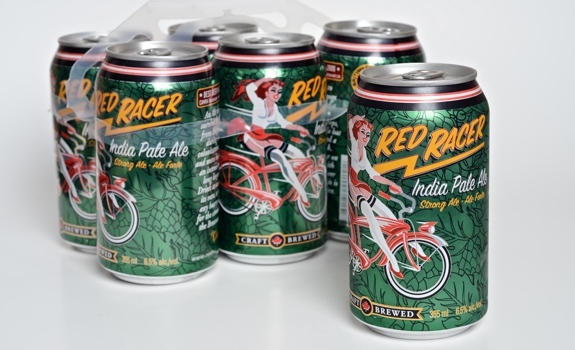 Red Racer India Pale Ale comes packaged in cans, not bottles. This is strange for a small-scale microbrew. That’s high praise, by the way. The Look: A can, which is an odd format for a microbrewery. Pretty design that features a young woman, posed pin-up-style on a bicycle, showing a bit of leg. Cute look. The beer itself is an amber-golden colour, with a smallish head that disappears quickly. The Taste: HOPS! Heavens, yes. First thing that hits you is pine, then some caramel sweetness, then mouth-puckering bitterness. After further sips, I got more citrus (grapefruit, mostly, with a touch of lemon). The taste is beyond intense. Thick, heavy mouthfeel with plenty of body. Pairs With: Something with a whole lot of flavour. I’d go for grilled meat, possibly with a nice marinade featuring some sweeter flavours to counter the beer’s aggressive bitterness, as well as rosemary. An idea that came to mind about halfway through a glass: This would be great with a bowl of hot, spicy chilli (topped with sour cream and green onions, naturally), served with a slice of maple cornbread. Yes, yes, but where can I get it? : After finding that liquor store after liquor store was out of stock of the stuff (including one shop in Edmonton that claimed it was no longer available in Alberta), I e-mailed the folks at Red Racer. As of the time I posted this, I’m still waiting patiently for a reply. If I get more info on availability (or lack thereof) in Alberta, I’ll share it here. From what I gather, the brewery’s capacity isn’t currently large enough to keep up with demand, though I recently read a story about their brewhouse undergoing a major expansion. Let’s hope that helps push more cans across the B.C. border. 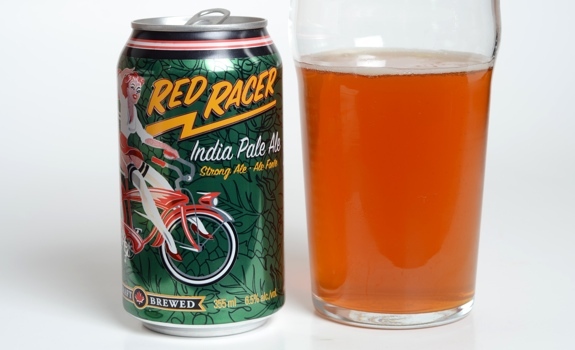 Red Racer India Pale Ale is nice-looking IPA. But it’s the taste that counts. Cost: $16.99 for a 6-pack of 355 mL cans at the Crowfoot Co-op Wines and Spirits store in Calgary. This is cheaper than I’ve seen it for elsewhere. Value for cash money: More expensive than other domestic microbrews, but the quality is great. Not an everyday beer; a rare treat, with a price to match. Availability: VERY limited. If you’re in B.C., lucky you. If you’re in Alberta, good luck. If you’re elsewhere in Canada, well … don’t hold your breath. Acceptable substitute: Because it’s so hard to find Red Racer’s India Pale Ale, may we suggest Red Racer ESB? It’s another super-hoppy brew that, for some reason, has been easier to find in Alberta in the last little while. It’s made with caramel malts and British hops, and lord knows you can taste those hops. It’s nicely dry and bitter, with grassy, piney notes. Different from the IPA, but there’s a clear family resemblance. Beerish power: 6.5 % a.b.v. The verdict: Superb. Very much a beer-geek’s beer. It’s intense, it’s an experience, and one beer has more flavour than an entire six-pack of lesser brews; truth is, it’s hard to drink more than one at a sitting. Worth every penny. Just tossing in my 2cents, but the last few times I’ve looked for the Red Racer(now Red Betty stateside) at Keg’n’Cork-south Edmonton-they’ve invariably only had the R/R ESB. And my local pub, The Next Act stopped carrying it quite awhile ago, despite it still being listed on their menu/beer list. I’ll have to phone Sherbrooke. P.S. Have you tried Dieu du Ciel’s Herbe a Detourne. They refer to it on the label, as a ‘new world tripel with Citra hops’. But it seems more of an imperial IPA…Great beer though & incredibly well-hidden 10.2%abv. Another heads up we Beer Geeks got was about the Anderson Valley beers -n we had brewery owner Trey White talk/Q&A/introduce samples of 5 of their beers. All very well-balanced, not the U.S. hop bomb type. If you’re into video reviews, check out this Calgarian’s assesment of Anderson Valley’s Summer Solstice-very nice Cream Ale, & DdC’s Herbe a Detourne. Just posting this here for anyone else looking for Red Racer IPA in Calgary, I picked a couple of 6 packs up from the Highlander Wine and Spirits on Richmond Road this past Saturday, I’m not sure if they regularly stock it, as I usually go there for the great whiskey and wine selection, but they have it currently.